Describes the stages of the ant life cycle. 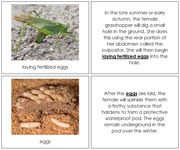 Ant life cycle nomenclature cards, charts & black-line masters. Describes the stages of the apple life cycle with beautiful photographs. 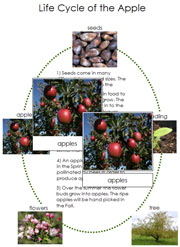 Apple life cycle in 3-part cards, life cycle charts, and black-line masters. Describes the stages of the banana life cycle. 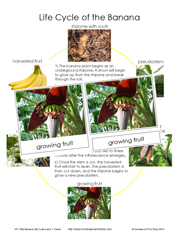 Banana life cycle nomenclature cards, charts, and black-line masters. 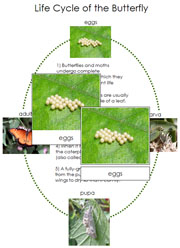 Describes the stages of the butterfly life cycle. 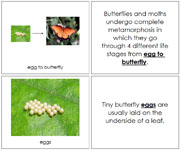 Butterfly life cycle in 3-part cards, life cycle charts, and black-line masters. 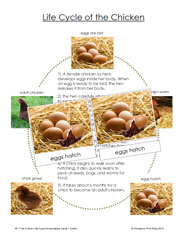 Describes the stages of the chicken life cycle. 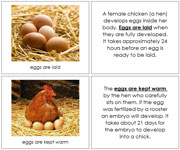 Chicken life cycle in 3-part cards, life cycle charts, and black-line masters. Describes the stages of the dragonfly life cycle. Dragonfly life cycle in 3-part cards, life cycle charts, and black-line masters. 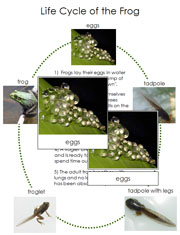 Describes the stages of the frog life cycle. 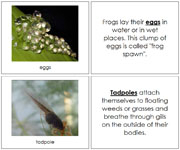 Frog life cycle in 3-part cards, life cycle charts, and black-line masters. 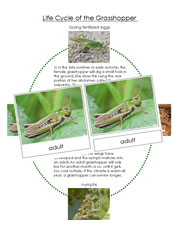 Describes the stages of the grasshopper life cycle. 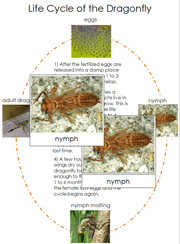 Grasshopper life cycle nomenclature cards, charts, and black-line masters. 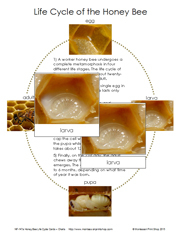 Describes the stages of the honey bee life cycle. Honey bee life cycle nomenclature cards, charts, and black-line masters. 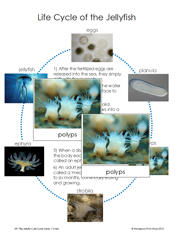 Describes the stages of the jellyfish life cycle. Jellyfish life cycle in 3-part cards, life cycle charts, and black-line masters. Describes the stages of the kangaroo life cycle. 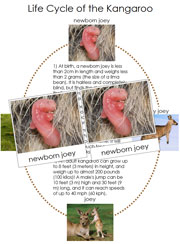 Kangaroo life cycle in 3-part cards, life cycle charts, and black-line masters. 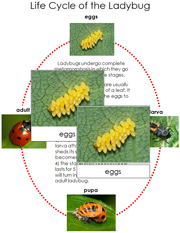 Describes the stages of the ladybug life cycle. Ladybug life cycle cards & charts, and black-line masters. 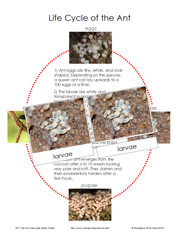 Describes the stages of the orange life cycle with beautiful photographs. Orange life cycle in 3-part cards, life cycle charts and black-line masters. Describes the stages of the pineapple life cycle. 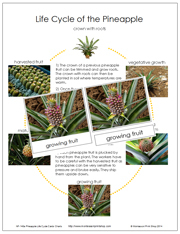 Pineapple life cycle nomenclature cards, charts, black-line masters. 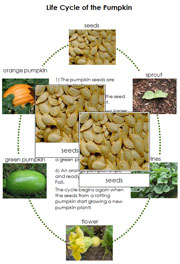 Describes the stages of the pumpkin life cycle. 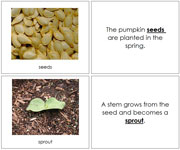 Pumpkin life cycle in 3-part cards, life cycle charts, and black-line masters. Describes the stages of the salmon life cycle. 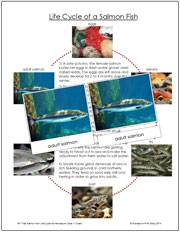 Salmon life cycle in 3-part cards, charts, and black-line masters. 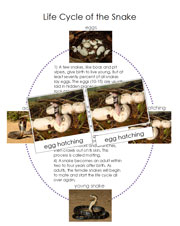 Describes the stages of the sea turtle life cycle. 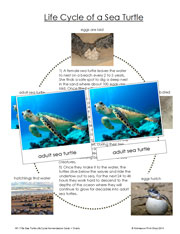 Sea turtle life cycle in 3-part cards, charts, and black-line masters. Describes the stages of the snake life cycle. Snake life cycle in 3-part cards, life cycle charts, and black-line masters.